Flute Flight takes you on a sound healing journey, combining the beautiful sounds of silver and wood flutes, with a variety of special instrumentation to create a unique sound unmatched by others. The warm yet haunting sounds of the flutes blend with the artful piano and guitar work by Cory Edwards, percussion by Josh Daly, gongs, singing bowls, Kaizen drum and Na’am plates by Pati Pellerito – LMT CSH. Music composed by Sherry Finzer & Mark Holland. Flute Flight won the Best Relaxation/Meditation Album 2015 from Zone Music Reporter and was nominated Best Relaxation/Meditation Album 2015 by One World Music Radio. Sherry’s sound is influenced by the different genres of music she plays, by the artists she collaborates with, and by the flutes she uses. She uses various types of flutes to create her pieces, where the sounds of wind instruments are mixed with Gregorian chants, ethereal sounds, and other ethnic instruments to create a relaxing experience. Reviewers have described her playing as “deeply haunting…calms and yet piques the senses.” Echoes host John Diliberto has referred to Sherry’s sound as “Winged Chamber Music.” Her last release, Sanctuary III: Beyond the Dream was #1 on Echoes for January 2015, and also received nominations from ZMR and OWM for Best Album – Acoustic 2014. Award winning artist Mark Holland is considered by many authorities on the Native American Flute to be among the top flutists performing and recording today. Leader and founder of Autumns Child, Mark Holland has been called, “the Jimi Hendrix of the Native American Flute”. His unique approach and usage of the flute along with his technical skills brings about such comparisons. Holland has described his project Autumns Child as Global Chamber Music; a hybrid of world, jazz, classical and folk styles. Through Autumns Child, Holland showcases the versatility of the Native American Flute, creating a new acoustic instrumental fusion, an eclectic sound that is truly one of a kind. Mark Holland started Autumns Child in 1995. He began his publishing and record label, Cedar n Sage Music in 1997. He has recorded 16 CDs to date. Holland has a B.A. in Music from the University of Missouri where he studied with two members of the Saint Louis Symphony. Mark Holland is known for his unique soulful style of “playing from the heart”. Holland has been a featured artist at the International Native American Flute Association conventions in Kent, Ohio and Taos, New Mexico and Belmont, California and Eau Claire, Wisconsin. He has also been a featured artist appearing at Musical Echoes, Flute and Art Festival in Fort Walton Beach, Florida as well as Zion Canyon Flute and Art Festival in Zion Canyon National Park, Utah. He has also been a featured artist at the Potomac Native Flute Festival in Rockville, Maryland and the Yosemite Flute Festival in Oakhurst, California and the Magic Valley Flute Festival in Filer, Idaho and the Native Rhythm Flute Festival in Melbourne, Florida as well as Flower Mound Native Flute Retreat in Texas and the Chippewa Valley Flute Retreat in Michigan. Mark was also featured artist at the Oklahoma Native Flute Festival in Tallaquah, Oklahoma and the Sunwatch Flute Festival in Dayton, Ohio. Holland has recorded some tracks for a future PBS documentary, “Redemption Road”. He appeared as a guest on Capitol recording artist Chris Ledoux’s CD, “Horsepower”. Sherry and Mark first met around 2006 on one of the first musician networking sites, Myspace. They each enjoyed and appreciated each other’s music and tone of their respective flutes. On one of Mark’s tours throughout AZ, he invited Sherry to join him on an improvisational song, and continued to invite her to sit in on various shows over the next few years. 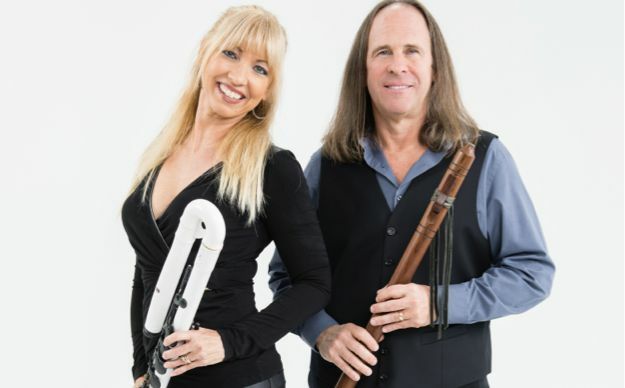 Mark and Sherry both knew that the blend of their sounds created something meaningful and magical, and in March 2015, they performed many shows together throughout AZ as a duo, and received many requests from their fans to record an album together. So in May of 2015, Sherry flew to St. Louis to record Flute Flight with Mark at Sawhorse Studios. Pati Pellerito joins them in their collaboration by adding a very creative variety of healing instruments, such as Tibetan singing bowls, gongs, and Kaizen drum. Cory Edwards adds his sensitive musical touch on piano, synthesizer and guitar, while Josh Daly throws in a splash of world percussion. Flute Flight synergistically blends and balances the silver flute with the wood flute. Music that is passionate and sensuous. Colorful and expressive. Alluring and enchanting. Flute Flight will transport you along an enigmatic sound journey.